Growing up with a brother or sister who has autism is a unique experience. Research suggests that siblings often experience difficult emotions including guilt, anger, resentment, loneliness, envy, embarrassment, and anxiety. Siblings may feel as though they get less attention, their needs are not a priority, they are expected to behave perfectly all the time, or they are the only ones who have ever had to live with a sibling with autism. Embarrassment around their peers can occur and some are at risk of being bullied. Adolescent siblings may believe they have increased responsibilities or feel more pressure to succeed. These emotional challenges can also result in physiological responses. Depending on their age, some siblings may have trouble identifying and expressing these emotions, which in turn can affect sleep, diet, and behavior. Siblings may also develop high anxiety resulting in physical issues or panic attacks. They sometimes express these feelings openly, but many bottle them up inside because they feel ashamed or don’t want to put further stress on their parents. Support strategies that help siblings identify and positively express these emotions can help reduce these risks. One way siblings can learn support strategies is by participating in sibling support programs. Facilitated discussions and therapeutic play help siblings learn to express their emotions in a supportive environment and connect with others who share similar concerns. These programs also provide lifelong skills that are necessary to build positive relationships with peers, increase self-esteem, and communicate effectively with family members. The Johnson Center is committed to supporting all family members, including siblings. For several years now we have offered ongoing sibling groups or sibling camps for various age groups. Lead by a team of counselors, psychologists, and child life specialists, our sib groups implement activities that focus on specific learning objectives including: understanding autism, family and peer issues, identifying feelings, and coping and problem solving. Past camps have integrated art, yoga, songwriting, writing, and acting. 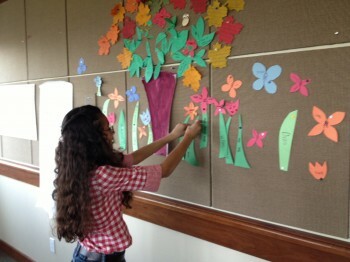 In our office, we have a growing coping garden from previous sib camps in which participants shared fun coping ideas on each leaf. Previous activities also included creating a Sibling Advice Column in which siblings can offer advice to one another. This activity increases emotional awareness, creates opportunities to connect with peers, and helps to support and validate siblings’ feelings. By implementing fun and expressive activities we hope to create a toolbox of positive skills siblings can use to help build stronger relationships within their family and community. Siblings learn how to positively communicate their concerns and feelings to their parents and have a stronger bond with their brother or sister. We understand that this is a critical time for all family members, especially young siblings. We hope that by offering support now, we can help shape and build positive family relationships for the future.